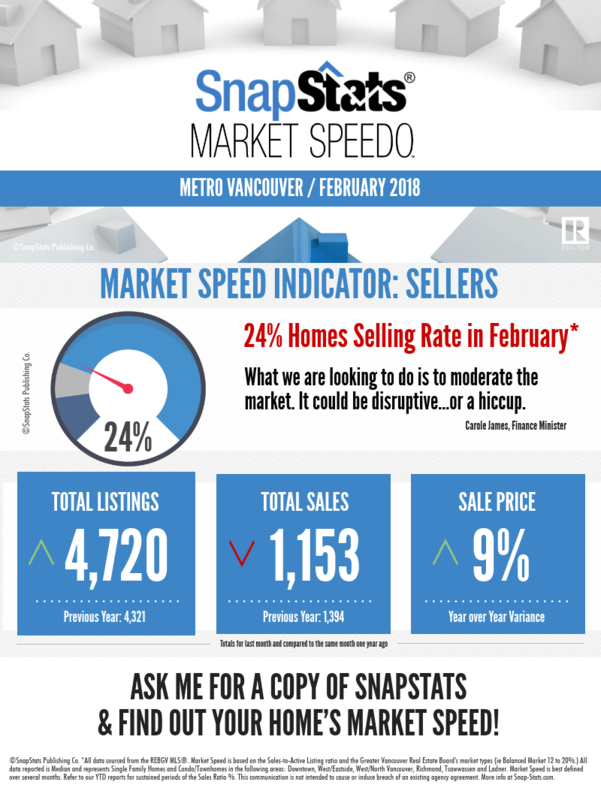 The Real Estate Board of Greater Vancouver (REBGV) reports that residential property sales in the region totalled 2,207 in February 2018, a 9% decrease from the 2,424 sales recorded in February 2017, and a 21.4% increase compared to January 2018 when 1,818 homes sold. Last month’s sales were 14.4% below the 10-year February sales average. 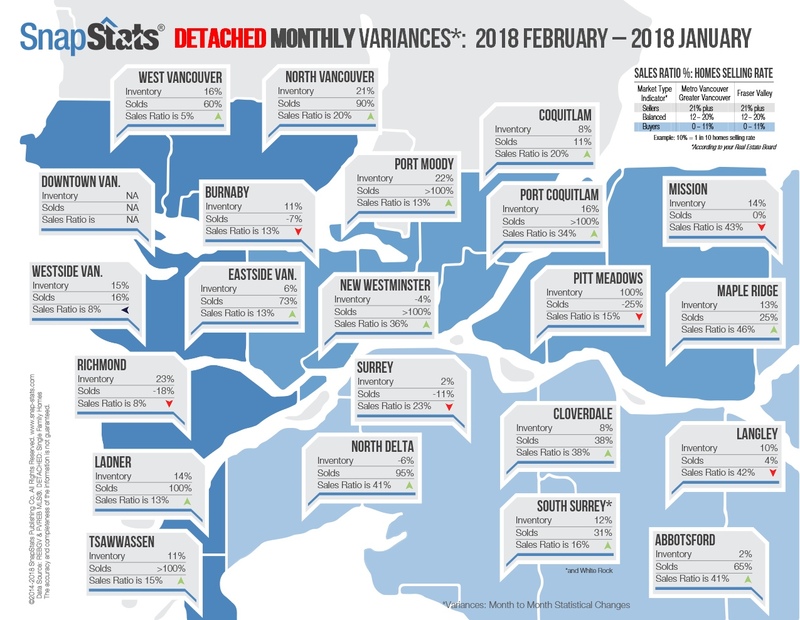 By property type, detached sales were down 39.4% over the same period, attached sales were down 6.8%, and apartment sales were 5.5% above the 10-year February average. There were 4,223 detached, attached and apartment properties newly listed for sale on the Multiple Listing Service® (MLS®) in Metro Vancouver in February 2018. This represents a 15.2% increase compared to the 3,666 homes listed in February 2017 and an 11.2% increase compared to January 2018 when 3,796 homes were listed. The total number of homes currently listed for sale on the MLS® system in Metro Vancouver is 7,822, a 3% increase compared to February 2017 (7,594) and a 12.6% increase compared to January 2018 (6,947). For all property types, the sales-to-active listings ratio for February 2018 is 28.2%. By property type, the ratio is 13% for detached homes, 37.6% for townhomes, and 59.7% for condominiums. The MLS® Home Price Index composite benchmark price for all residential properties in Metro Vancouver is currently $1,071,800. This represents a 16.9% increase over February 2017 and a 1.4% increase compared to January 2018. Sales of detached properties in February 2018 reached 621, a 16.6% decrease from the 745 detached sales recorded in February 2017. The benchmark price for detached properties is $1,602,000. This represents an 8.2% increase from February 2017 and is virtually unchanged from January 2018. Sales of apartment properties reached 1,185 in February 2018, a 7.1% decrease compared to the 1,275 sales in February 2017. The benchmark price of an apartment property is $682,800. This represents a 27.2% increase from February 2017 and a 2.6% increase compared to January 2018. Attached property sales in February 2018 totalled 401, a 0.7% decrease compared to the 404 sales in February 2017. The benchmark price of an attached unit is $819,200. This represents an 18.1% increase from February 2017 and a 1.9% increase compared to January 2018. If you would like to have a copy of the market report and/or have questions about the market, please feel free to email me at hello@richardbao.ca.